To prepare the filling, combine the cream cheese, egg, flour and confectioners’ sugar in a medium bowl and mix well until blended and smooth. Set aside. 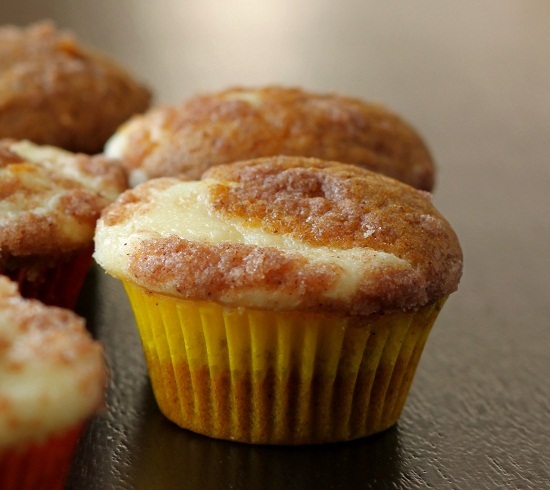 To assemble the muffins, fill each muffin about 2/3 full with batter. Add a dollop of filling on top. (I would say I used about a tablespoon of batter and a heaping teaspoon of filling. They were pretty full going into the oven.) Sprinkle with topping. Bake or 14 minutes. Cool. Eat. Smile.